Pharmacology, Toxicology and Biomedical Reports,2017,3,3,55-61. 1Research Scholar, Department of Zoology, Auxilium College (Autonomous), (Affiliated to Thiruvalluvar University), Gandhi Nagar, Vellore, Tamil Nadu, INDIA. 2Department of Marine Biotechnology, Periyar University, Salem, Tamil Nadu, INDIA. Objective: Encapsulation of dexamethasone (DEX) anticancer drug with Poly (d, l-lactide-co-glycolide) (PLGA) microsphere (MS) was carried out for sustained release system. Methods: The characterizations of MS were analyzed using XRD, FTIR, RP-HPLC, TEM, CLSM, and XRD patterns and reported the physical state of the encapsulated PLGA microsphere (DEXPLGA MS). Results: The presence of 2 θ peaks values at 33.17°, 35.63°, 49.46° and 54.09° confirmed the semi-crystalline phase for the DEX drug. FTIR showed peaks at 1695 cm−1, 1644 cm−1 and 1602 cm−1 were shown to be confirming DEX encapsulation. The MTT assay showed a greater cellular uptake of DEX-PLGA MS and the new formulation showed steady and sustained release of DEX resulting in a lower short term cytotoxic effect against HEP-G2 cells. Conclusion: In the present study, the drug encapsulation microsphere is non-toxic, simple, and an ideal method for anticancer drug release. 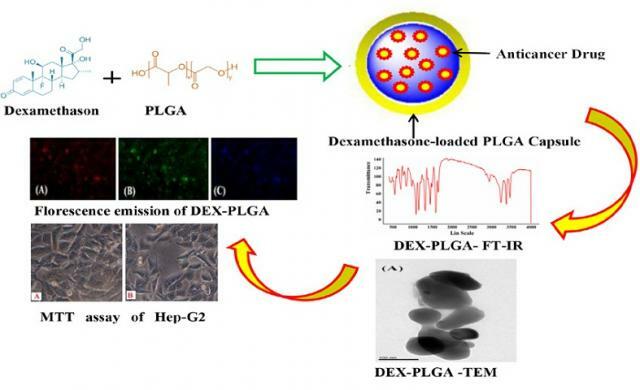 The present results revealed that the use of DEX-PLGA MS offers large-scale production of biocompatible microspheres that can be used against HEP-G2 cells.